My research focuses on the molecular actions of drugs of abuse on the development of central and peripheral nervous systems with an emphasis on brain "reward" pathways and the cardiorespiratory control centers in the brainstem. One major goal is to characterize the interaction between the cholinergic and dopaminergic systems in the “reward” centers of the brain. A second major goal is to determine the pathways that regulate autonomic control of the heart and their interaction with the intrinsic cardiac neuronal network and how nicotinic receptors are involved. Both, short and long-term effects of drugs of abuse, primarily psychostimulants, are studied in in vitro and in vivo systems using primary cell cultures, and various animal models and human tissues. For all studies, the laboratory employs a multidisciplinary approach using molecular, pharmacological, electrophysiological, echocardiographic, and neuroanatomical methods. 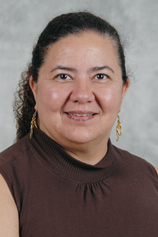 Dr. Dávila-García is a member of the Society for Neuroscience (SfN), the American Society of Pharmacology and Experimental Therapeutics (ASPET), American Physiological Society (APS), American Heart Association (AHA) and the Society for Nicotine and Tobacco Research (SNRT). Dávila-García, M.I., Musachio, J., and Kellar, K.J. 2003. Chronic nicotine does not alter nicotinic acetylcholine receptors in adrenal gland, SCG, Pineal or Retina. J. Neurochem. 85:1237-1246. Mathew, S.V., Law, A.J, Lipska, B.K., Dávila-García, M.I., Zamora, E.D., Mitkus, S.N., Vakkalanka, R., Straub, R.E., Weinberger, D.R., Kleinman, J.E., Hyde, T.M. 2007. α7 nicotinic acetylcholine receptor mRNA expression and binding in postmortem human brain are associated with genetic variation in Neuregulin 1. Hum Mol Genet.16(23):2921-32. Razani-Boroujerdi, S., Boyd, R., Dávila-García, M.I., Nandi, J.S., Mishra, N., Singh, S.P., Pena-Philippides, J.C., Langley, R., and Sopori, M.L. 2007. T cells express alpha7-nicotinic acetylcholine receptor subunits that require a functional TCR and Leukocyte-specific protein tyrosine kinase for nicotine-induced Ca2+ response to increase intracellular. J. Immunol. 179:2889-2898. Wang, H., Dávila-García, M.I., Yarl, W., and Gondré-Lewis, M.C. 2011. Gestational nicotine exposure regulates expression of AMPA and NMDA receptors and their signaling apparatus in developing and adult rat hippocampus. Neuroscience 188:168-81.